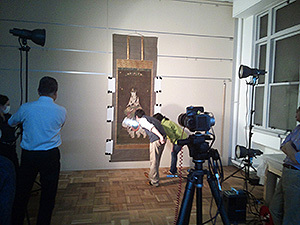 The Department of Art Research, Archives, and Information Systems has conducted joint studies of Buddhist paintings from the Heian Period with the Tokyo National Museum. These studies seek to precisely image paintings in the museum’s collection and explore aspects of their production in further detail than that offered by observation with the naked eye. A Painting of Akasagarbha (a National Treasure) and a Painting of the Thousandarmed Kannon (also a National Treasure) were previously studied. This year, a Painting of Samantabhadra (a National Treasure as well) was imaged on March 26, 2014. This work is one of the most acclaimed Buddhist paintings from the Heian Period. The images obtained will be examined by the Department of Art Research, Archives, and Information Systems and researchers from the Tokyo National Museum, and the painting’s significance to art history will be studied in the future. The Department of Art Research, Archives, and Information Systems conducts a monthly seminar to share information on relevant research. A seminar entitled Research on and Development of an Internet Version of Mizue: Prospects for the Digital Publication of Art Historical Resources and Art Archives began at 2 PM on March 25, 2014. During the seminar, presentations were given by TSUDA Tetsuei, Head of the Art Research Materials Section, KIKKAWA Hideki, an Associate Fellow at the Institute, MARUKAWA Yuzo, Associate Professor of the National Museum of Ethnology, and NAKAMURA Yoshifumi and YOSHIZAKI Mayumi of the National Institute of Informatics. 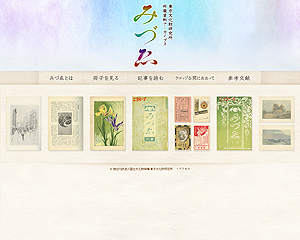 The presentations covered Mizue, an art journal that was first published in 1905. The journal subsequently suspended publication in 1992, it resumed publication in 2001, and it then suspended publication again in 2007. Since this journal has been published for almost a century, it has had a profound effect on art in modern Japan, and it clearly has documentary value. Moreover, volumes prior to volume no. 90, which were published in the Meiji Era, are hard to obtain and few institutions have those assembled volumes in their collections. Accordingly, issues of the journal are treated as valuable written works by the Institute. At the same time, there was a growing call for the journal to be made publicly available. Since most of the copyrights to articles and other pieces in the volumes published during the Meiji Era had expired, the Department of Art Research, Archives, and Information Systems and the Center for Research and Development into the Informatics of Association of the National Institute of Informatics drew on their extensive know-how to jointly research and develop a way to make those issues available internet. This project started in 2011 and lasted 3 years. With Mizue serving as a test case, this joint research and development looked at one possible way of publishing information on cultural properties primarily in text format. This effort was originally part of a Department of Art Research, Archives, and Information Systems research project on General Research regarding the Publication and Utilization of Research on Cultural Properties. The seminar on March 25 was conducted for the Department of Art Research, Archives, and Information Systems to internally share information regarding the results of this research and development. 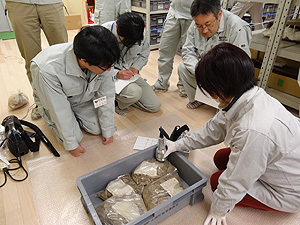 The internet version of Mizue that resulted from joint research and development has been made publicly available as Mizue from the Materials Archive of the National Research Institute for Cultural Properties, Tokyo. Please feel free to have a look (http://mizue.bookarchive.jp/). 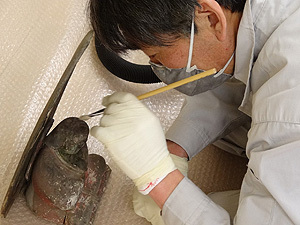 As part of Japan’s International Contribution to the Conservation of Cultural Heritage (expert exchanges) commissioned by the Agency for Cultural Affairs, Japan, a Survey of the Current State of Cultural Heritage that is Likely to be Affected by Climate Change was commissioned by the Japan Center for International Cooperation in Conservation. The survey was conducted from February 18th to March 5th. The areas surveyed were the 3 Oceanic nations of Kiribati, Tuvalu, and Fiji. These nations are threatened by rising sea levels due to climate change. 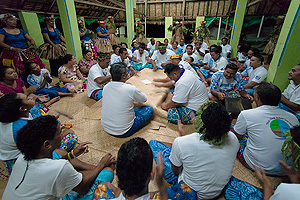 The capital and outlying islands of Kiribati and Tuvalu were visited, and the current state of cultural heritage, which includes traditional dances, folk techniques, traditional architecture, and sacred sites, was surveyed. Damage due to rising sea levels was noted. Surveyors talked with administration officials and chieftains on outlying islands. Both countries face real problems in terms of the deterioration and disappearance of cultural heritage as well as the erosion of the country itself due to rising sea level. Sustainable intangible cultural heritage helps to maintain a people’s identity even if they are forced to emigrate overseas; representatives from both countries were cognizant of this fact. One example of cultural heritage is the large meeting houses that are found in villages in both countries. Various observances, such as religious rites and dances, are performed at these meeting houses. The culture related to these meeting houses is intangible and their architecture and building techniques and materials are closely linked to various elements, such as nature. These buildings represent the survival of that culture. At the University of the South Pacific in Fiji, surveyors exchanged opinions with researchers in relevant fields. This survey was significant in terms of considering the future of the cultural heritage of Oceanic island nations. Together with cooperating organizations, the Department of Intangible Cultural Heritage operates the 3/11 Reconstruction Assistance: Intangible Cultural Heritage Information Network [note: the Great East Japan Earthquake struck on March 11, 2011]. 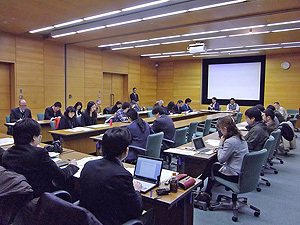 The 2nd conference on the Network was held March 5, (Wed.), 2014 in a conference room in the Institute’s basement. This conference follows the 1st conference that took place in March of last year when the Network was created. Attendees shared information and exchanged opinions on restoration of intangible cultural heritage damaged by the Great East Japan Earthquake. Attendees (37 individuals) spanned a range of fields, from researchers and administration officials to individuals working in affected areas, support organizations, religious representatives, and members of the media. The latter half of the conference featured a report by guest speaker Kei TANAKA (the Tsumugu Project) and a report by Takeshi ABE (Tohoku Institute of Filmed Cultural Properties). 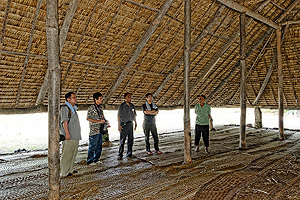 Discussion primarily concerned documenting intangible cultural heritage in affected areas. “Documenting” intangible cultural heritage is a term that encompasses several aspects. Aims of the 2nd conference included: (1) documenting intangible cultural heritage to facilitate its continuation, (2) documenting intangible cultural heritage that can no longer be handed down, (3) documenting intangible cultural heritage to encourage its transmission to children and young people, and (4) documenting intangible cultural heritage to highlight its widespread existence. The creation of this new Network is anticipated to prove effective in achieving these aims by documenting intangible cultural heritage. Nevertheless, conditions differ in each of the areas affected by Great East Japan Earthquake. The 2nd conference affirmed the approach of fully ascertaining the needs of these areas and then restoring intangible cultural heritage.